The shoulder is a complex joint that keeps your arm from its natural desire to fall out of its socket while enabling a wide range of motion in all 3 planes. The joint capsule, rotator cuff muscles, and the tissue connected to your bone, called the labrum, all work to stabilize the joint. Swimmers and water polo players increase their range of motion by creating tiny tears in their labral tissue, trading in shoulder stability for greater mobility. However, high mobility combined with overtraining can compromise the labrum by creating a larger, painful tear. This can be caused by an acute event or gradual repetition.Shoulder injuries are ubiquitous in sports, but swimmers, water polo players, and any athletes that execute repetitive overhead motions are exceptionally at risk. You are 1/3 more likely to dislocate your shoulder with a torn labrum. The labral tissue has little blood supply so these injuries do not heal easily. The frayed ends of a tear contain nerves that cause pain with motion. Depending on the size of the tear, surgery may be necessary to reattach the tissue to the bone, while more minor tears can avoid surgery partially by strengthening the surround musculature to compensate for weakened tissue. Despite the advantage associated with greater mobility in athlete’s joints, larger tears in the labrum can be painful, severely compromise shoulder stability, and lead to worse injury. The terms “separated shoulder” and “dislocated shoulder” are thrown around in sports so often that it is easy to misinterpret their origin. A separated shoulder injury occurs at the most important joint between the thorax and arm, known as the acromioclavicular (or AC) joint. Located between the end of your clavicle and your scapula, the AC joint and surrounding ligaments are subject to high load transferring from the chest to the upper arm. Ligament tears from falling on your shoulder, especially with your hand outstretched, or striking something hard (like a body check in hockey), allow the clavicle to separate from the scapula, thus the term shoulder separation. 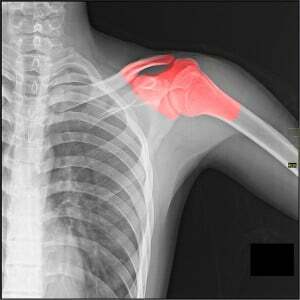 In a shoulder dislocation, the upper arm bone, known as the humerus, pops out of the socket known as the glenoid. This injury can also occur from falling, as your body weight pushes the humeral head out of place. The labrum, joint capsule, and muscles are supposed to stabilize the joint and prevent dislocation, but if any of the three are injured, dislocation occurs more readily. A dislocated shoulder can be pushed back into place, and pain may diminish very quickly. Resting your shoulder will prevent re-dislocation, and therapy can improve your range of motion gradually. Separated shoulders are treated by first immobilizing the AC joint with a sling. In a minor separation, healing may take a few weeks, whereas a larger separation may take weeks to months and involve surgical reattachment of torn ligaments1. The rotator cuff muscles are the primary source of movement and stability in the shoulder. They allow you to move your arm up, down, forward, back, and do internal and external rotation. Even when you think you’re not using your arm, these muscles are contracting just to keep your arm from falling out of its socket! Known as the SITS muscles, the rotator cuff muscles include the supraspinatus, infraspinatus, teres minor, and subscapularis. The supraspinatus is responsible for moving your arm upward in the first 60 degrees away from your body. The infraspinatus and teres minor allow external rotation and the subscapularis is mainly responsible for internal rotation. Conducting your weight-lifting with these movements in mind can help you target your shoulder muscles specifically. If you feel pain in any of these directions, you should consult a physician to determine how severe an injury you may have. Tears in the SITS muscles are rarely repaired with surgery, as it is akin to sewing up beef—the muscle is not easily stitched together. Especially with throwing, hitting, or weight-lifting, be mindful of pain in your shoulder and avoid motions that could lead to injury. Small tears lead to swelling and more tearing. Returning to play too soon will only increase your risk of more tears and slow the healing process dramatically. Shoulder injury awareness with exercise is the first step to preventing injury! Internal Rotations: Connect the resistance band to a secure location at waist height. Place your feet at hip width and a rolled towel, or other soft 3-4 inch item in between the inside elbow and the side of your body. Hold the band with your inside hand and bend your arm at a 90 degree angle. Extend band towards opposite elbow, rotating at shoulder. Keep your elbow tight against the body pinch your shoulder blades together throughout the motion. Repeat for 8-12 reps, then repeat with other arm. External Rotations: Stand perpendicular to the location where the resistance band is secured. Place your feet at hip width and a towel in between your outside elbow and body. Hold the band with your outside hand and bend your arm at a 90 degree angle. Extend band away from the location secured, rotating at shoulder. Keep elbow tight against the body. Repeat movement for 8-12 reps, then repeat with other arm. Connect the resistance band to a secure location at waist height. Stand facing away from the location where the band is secured with your feet at hip width. In one hand, hold the band at the side of your body, arm extended. Extend the band directly forward, rotating at shoulder. Arm extended, parallel to floor. Repeat movement for 8-12 reps, then repeat with other arm. Posterior Raises: Stand facing resistance the location where the band is secured with your feet at hip width. In one hand, hold band at side of body, arm extended. Extend the band directly backward, rotating at shoulder. Repeat movement for 8-12 reps, then repeat with other arm. Don't have a resistance band? You can find one here. Discover nutrition's role in injury prevention here.